Cisco announced a business-oriented pad somewhat similar to IPad. While intriguing, it’s not the most intriguing new thing I learned today at networkers, so let me write briefly about LISP. I will be brief today. Tuesday at the show is always busy. The big party for all attendees is Wednesday night, and monday night is free beer and food on the show floor, so all the folks doing smaller get togethers try to schedule Tuesday night. Also I found this read on Cisco’s site on it. I am sure there is more over there, but I didn’t find too much. The Internet Architecture Board’s (IAB)’s October 2006 Routing and Addressing Workshop  renewed interest in the design of a scalable routing and addressing architecture for the Internet. Many concerns prompted this renewed interest, including the scalability of the routing system and the impending exhaustion of the IPv4 address space. Since the IAB workshop, several proposals have emerged that attempt to address the concerns expressed both at the workshop and in other forums [7,9,12,13,14]. All of these proposals are based on a common concept: the separation of locator and identifier in the numbering of Internet devices, often termed the “Loc/ID split.” This article focuses on one proposal for implementing this concept: the Locator/Identifier Separation Protoco (LISP) . Wendell Odom is wondering what we would ask the Cisco Certification folks if we had the chance next week at Cisco Live. Cisco Live 2010, aka Networkers, starts the week of June 28th in Vegas. As usual, whenever I go to this or any other trade show event, there’s usually a short list of questions that I’ve been pondering. So, when walking around the show floor, I seek out those who might have an answer to a question. Long story short, knowing that a lot of ya’ll may not be going to the show, I thought I’d turn the question about questions to you folks: if you could go to Networkers next week, and ask the Cisco certifications folks a question, what would you want to know? 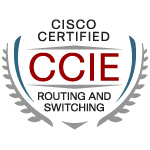 Sometimes CCIE candidates have problems understanding complexities of route redistribution. One of the things that seems to have some levels of confusion associated with it is redistribution of connected routes and problems it may cause when combined with redistribution of other routing protocols. Let’s clear out that confusion. I am feeling better about everything today in dealing with this exam. I am moving forward with what got me close last year and that is the plan I am sticking with for this attempt. The only difference this time is I am going to stick with the divide and conquer approach that helped me through MPLS. I think my problem with QOS and Security was trying to take it all in at once instead of one piece at a time. That just lead to being frustrated over and over again. I think that is the key, limit the levels of frustration. Walk away for a little while if you need to. Take a break and refresh.